Slydesblog: One of THOSE parties…. Please tell me that you sat in the dunk tank and got dunked? honey: i don't know if i am that much of a masochist. Wow! That was SOME block party. I think I will take something away from this post that will stay with me forever and that is never to get into a bubble bouncer (or whatever those things are called) with a bunch of drunks! LOL. Aw, I was wondering if that was you in the banner. Let me see, in comparrison, I did yard work, did laundry, developed some film, put together some videos, worked on my mother's house and drank half a magnum of Shiraz in my garage while playing Medal of Honor on my GameCube. I need to get out more, obviously. Hey dude, i have to say your weekend definitely trumped mine! I ran oh and i ran! Literally! It's what i do! I run! Thats it! Just run! I would love to run and then bounce a bit! Then run some more!! FUN!!! How about posting a photo of yourself so we can all judge for ourselves??? HUH! Oh and I'm trying hard to catch up to Earl as ya most often commentor! Oh, it's been a long time since I've partied like that! I'm such a fuddy-duddy. Dude, you need to come over to my house and play Resident Evil with me one day. I have to party like that about once a year now, which is good because it used to be every weekend. i want that video.... please!!!!!! sounds like fun!! Mr Whipple squeezed your package 3 times...thats not bad action for half drunk adult in a bouncy house. btw, did you wake up the next morning bruised? teeni: as far as i know, the only thing that suffered was my dignity. sunshine: a pool would have been splendid. michelle: running definitly sounds healthier! 4leaf: ah, i love me some resident evil.. have you played UMBRELLA CHRONICLES? im on the final fight and i cant beat it solo. p.s. RE5 was just announced to have multiplayer! so we WILL be able to play it together! steph: beleive me, i cant do that more than once a year either..
sweets: what will you give me for it? abes: very bruised.. in my bathing suit area. Dude FELT like a LADY! Girl drinks and package squeezing? Sounds like my kind of party! 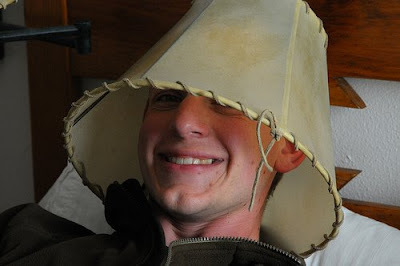 Hotter than Lampshade Head? Oh my, please reveal thyself! letty: hey, i do NOT feel like a lady! bina: i wish you were there! ali: yeah, i agree.. isnt that just like a man?